No matter how much you research the destination and prepare your packing list, there are some things you simply can’t afford to forget. You are about to embark on the vacation of your dreams. You have left your house sitter 5 pages of copious notes, and have caught up with your work to take you into the next quarter. You even pre-printed mailing labels to send postcards to 200 of your closest friends. You have packed your bags meticulously. You are well under you weight allowance, all of your carry on liquids are in small see-through containers, and you have split your checked items among members of your travel party so that if any bag doesn’t make it everyone has something. You are on it. Then you arrive at the check-in counter at the airport and get denied boarding because you neglected to check the expiration on your passport. Disappointment and fury are an understatement. Do not let this be you! Before you make any international travel arrangements, check the expiration date. Make sure it is current within six months of the date you are scheduled to return home. Make sure you have extra pages in your passport. If you are planning to visit multiple countries, do your research to learn the minimum amount a country requires. For example, South Africa requires that you have two blank pages upon arrival. 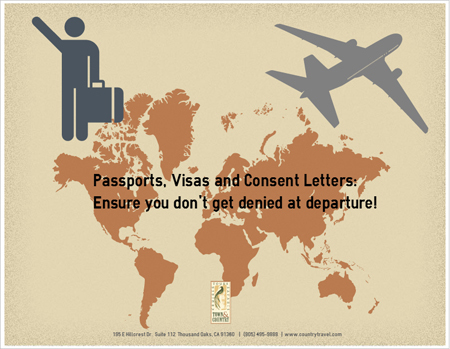 You can contact passport service, the consulate, or embassy to obtain additional pages. That passport is precious cargo. Please don’t set your coffee cup on it as if it’s a coaster, or let your toddler teethe on it. You will be denied at the airport if the pages are damaged and torn. If you are traveling with minors when one or more of the parents are not present, make sure to have the letter of consent to confirm you have permission to be traveling with them. While not related to travel specifically, it also a good idea to have a medical consent letter that authorizes the guardian to get treatment for a minor in a medical situation. The letter should include allergy and insurance information. Know the visa situation. Many countries require some sort of visa for entry, whether prior to or upon arrival. Know the amount, and make sure to bring cash to cover the visas you obtain upon arrival. And for extra credit: make paper copies and digital copies of your passports. Leave paper copies with a friend or family member at home, and email yourself digital copies so you can access them from your mobile device. This entry was posted on April 2, 2015 by townandcountrytravel in Travel Tips and tagged passports, travel tips, visas.